We're absolutely thrilled to say we're working with Childs Farm as a Brand Ambassador. Since having Patrick, who has extremely sensitive skin, we were on the hunt almost immediately for something to help nourish but also combat his skin troubles, and for us Childs Farm did exactly that. So we couldn't be more excited to be working alongside them. So when Patrick was born we assumed he was suffering from the normal baby acne, as he did appear to be quite red and rashy. Although as the first month wore on we soon realised it was probably actually his natural skin sensitivity and that we maybe should avoid using any old baby product on it. With Noah, we'd never had any trouble so stuck to the main brands you'd normally get, such as Johnsons. For P though, we knew we needed something a little more specialist, so I headed to Boots and that is where my love affair with Childs Farm began. I picked up their moisturiser and it really stood out to me that their packaging was a little more quirky that most, which in particular helps with my toddler who can sometimes be reluctant to a good lathering of moisturiser. As soon as he sees it, he's much more interested in what animals are on the bottle than the fact I'm whacking it all over him. Win win. But more than that, I loved how their products are free from parabens, mineral oils and artificial colours - what more could I want? That night we popped some onto Ps face and my goodness me, the results were noticeable overnight. Even John noticed (which is a massive thing) just how good Patricks skin was looking, he even gave him a good sniff as he smelt delicious. 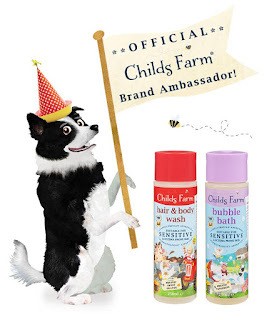 Since that day we've never looked back, so when Childs Farm reached out to us to become a Brand Ambassador, it was an offer we couldn't refuse. It's made life so much easier now, for instance beforehand I was having to wash Patrick and Noah separately as I didn't want Patricks sensitive skin to be exposed to some of the super foam bubble baths Noah likes to enjoy. But now with Childs Farm I don't have that added stress (lets face it, us Mums have enough) because both the boys can enjoy these fabulous products. And lets not forget another really important factor - the smell. Each product has it's own signature smell, my favourite being their brand new spray baby oil, which for me is just fantastic that I don't have to get my hands all gunky by pouring it onto them first, but the smell of it is so divine that I still want to. It's coconut and my goodness I just want to gobble my boys up when they have it on. Have you tried any Childs Farm products? If you wish to do so, feel free to use our discountr code CFAMB343 to get a fabulous 30% off their products.